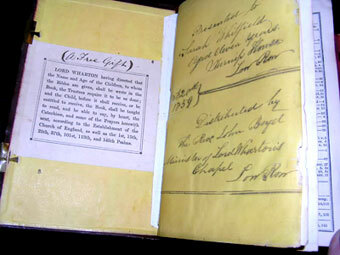 Lord Wharton's charity presented bibles to children for their personal use. 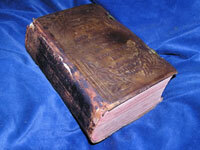 As a condition, the recipient had to be able to read and recite certain Psalms from memory (see below). 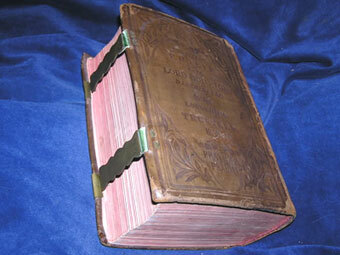 Lord Wharton having directed that the Name and Age of the Children, to whom the Bibles are given, shall be wrote in the Book, the Trustees require it to be so done; and the Child, before it shall receive, or be entitled to receive, the Book, shall be taught to read, and be able to say, by heart, the Catechism, and some of the Prayers herewith sent, according to the Establishment of the Church of England, as well as the 1st, 15th, 25th, 37th, 101st, 113th, and 145th Psalms. 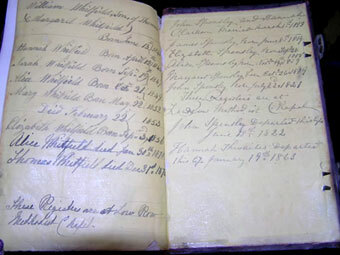 Whitfield, Spensley and Thwaite births and deaths were faithfully recorded on the inner rear covers of Sarah's bible. Sarah's father, Thomas Whitfield, a miner of Robin Gate, left a will (see Archives/Wills) which mentions that she married a J.W. Wallis.